We enjoyed our time at the suite. 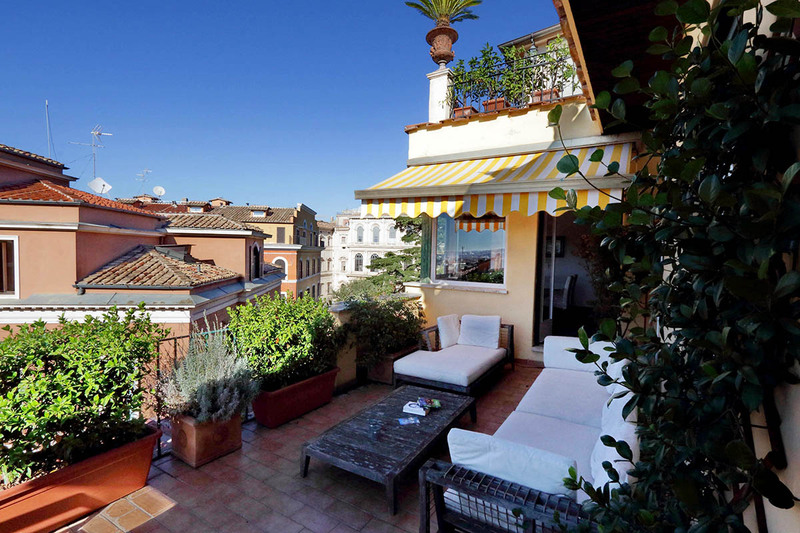 The suite is large, the location is excellent and the view of Rome is out of this world. Breathtaking! The terrace and views are unbelievable. The size, comfort, and amenities of the apartment are exceptional. And the location is wonderful. I've stayed at a really nice hotel in the area and I've stayed at good hotels in the area. I know that staying at this location was an exceptional value! Plus the beds were very comfortable!! The only thing that you might like to improve is some paitings on the walls in the living room and more ligth there and in the dining room. The apartment was perfect for two couples and was very comfortable. 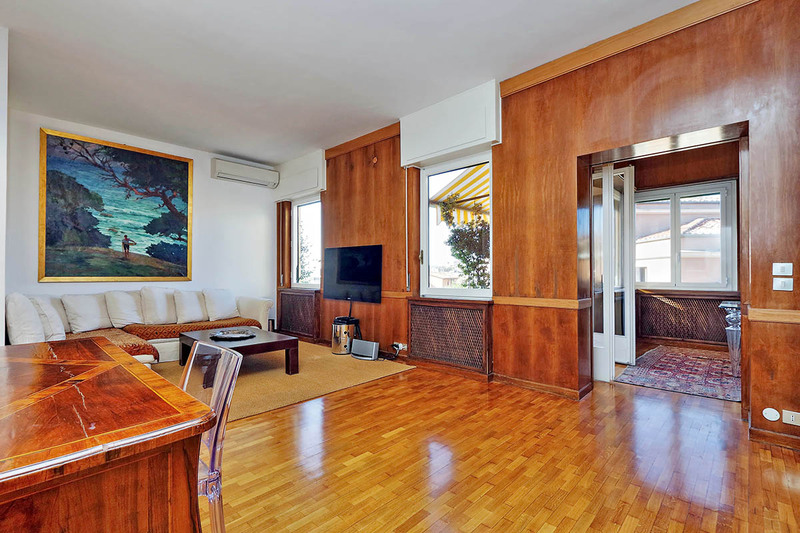 The vast living room of this apartment will make you feel like the captain of your own ship! 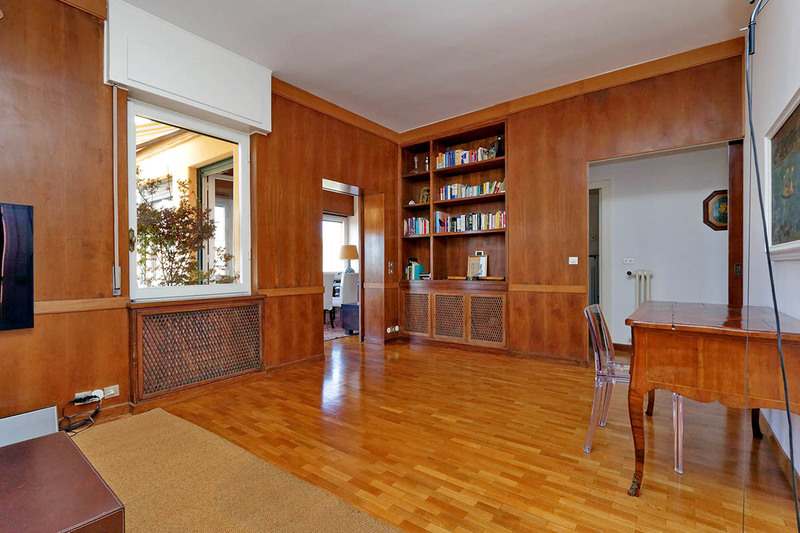 Its wooden panel walls and parquet give the impression of being inside a beautiful boat. 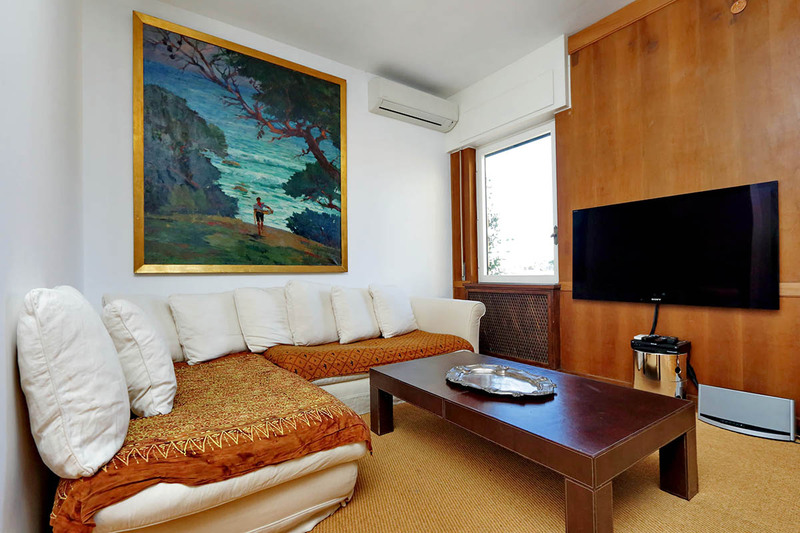 There is a comfy sofa and a large flat screen TV with DVD player and stereo system for your entertainment. In addition to this, there is a small writing desk with a chair in the opposite corner. Here, you will also find air-conditioning unit, which will ensure your comfort during hot summer days. The living room opens up to the beautifully decorated bright dining room with a glass table and four chairs. 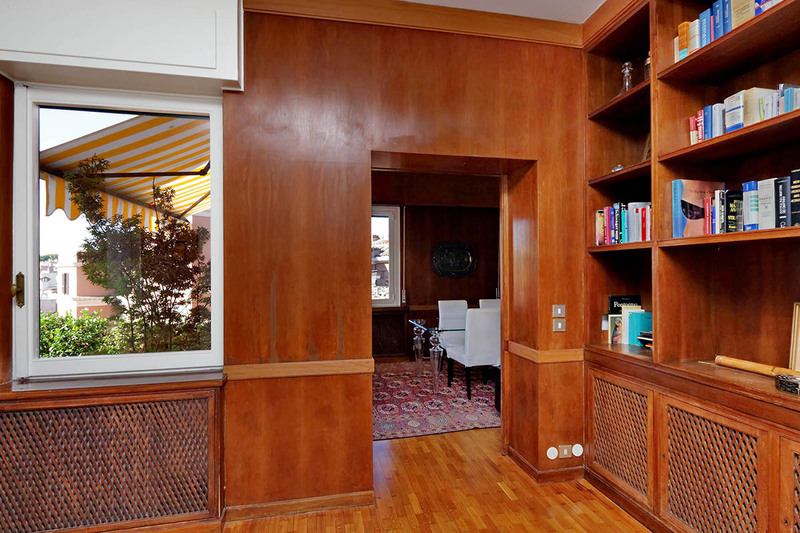 There is a direct exit to the terrace from the dining room through the large glass doors. 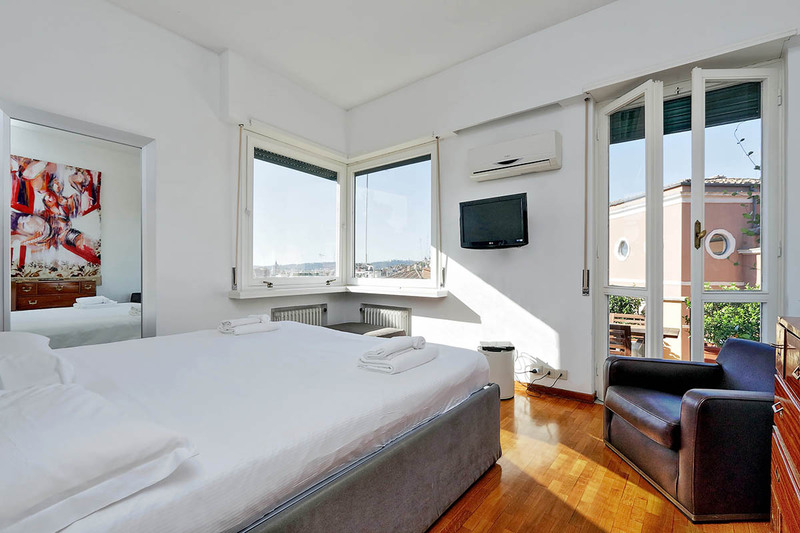 The well-illuminated master bedroom has a king-size bed, full-size mirror, another flat screen TV, and armchair. Guests will also have an air-conditioning unit at their disposal. From here, you can also access the terrace directly. The guest bedroom located on the other side of the apartment has a queen size bed. It is to note that there is no separate AC unit in this room. There are two separate full service bathrooms available for each of the bedrooms. Each of them have tiles of their own color decorating them. 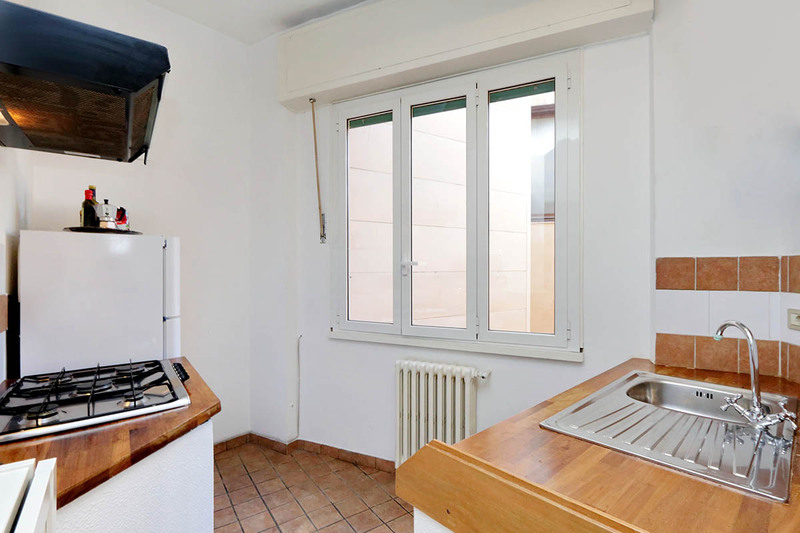 With so many different delicious food options in the area, you will barely need to cook yourself, but should you desire to, there is a fully equipped kitchen with a big fridge, a gas stove, a tea kettle and a sink. You will find all the necessary utensils in the drawers. 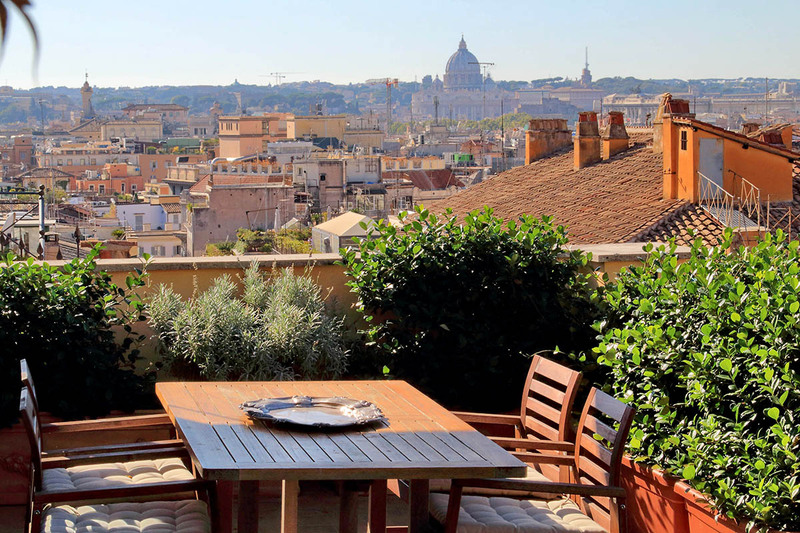 Being just a stone throw away from many popular sights, this wonderful terrace apartment will become your home away from home in the history-rich city of Rome. 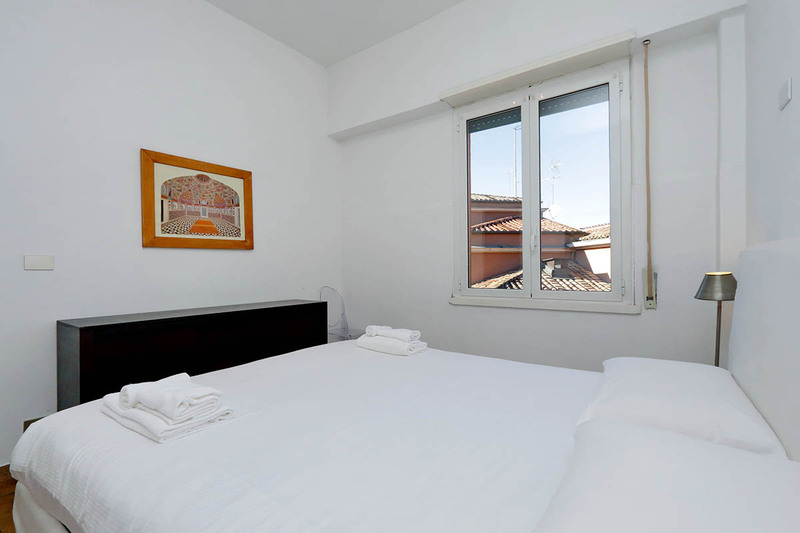 This makes it an ideal location for exploring the historical part of the Eternal city. Moreover, the best shopping opportunities that the fashion capital has to offer lie just one metro stop away. Getting off at Spagna you will find many designer and high-street shops such as Gucci, Prada, MaxMara, Zara, and H&M. 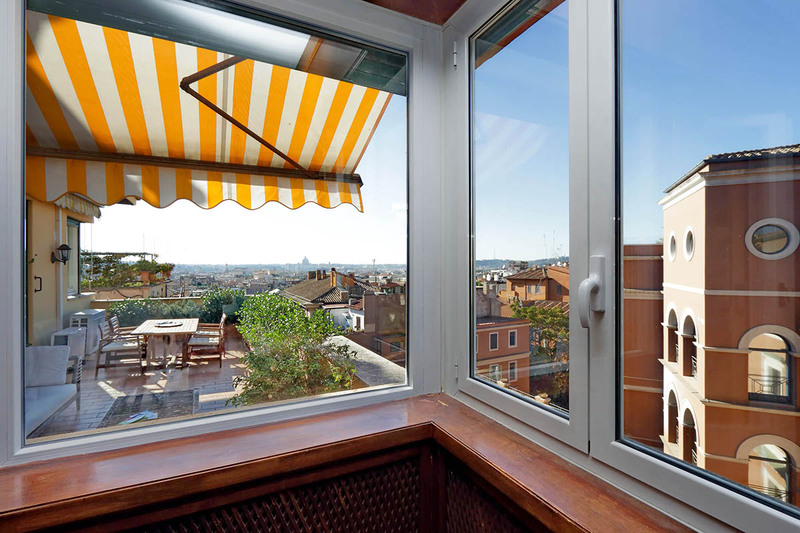 From here you have direct access to the Vatican, Spanish Steps, the Piazza del Popolo, and the Colosseum all by metro. 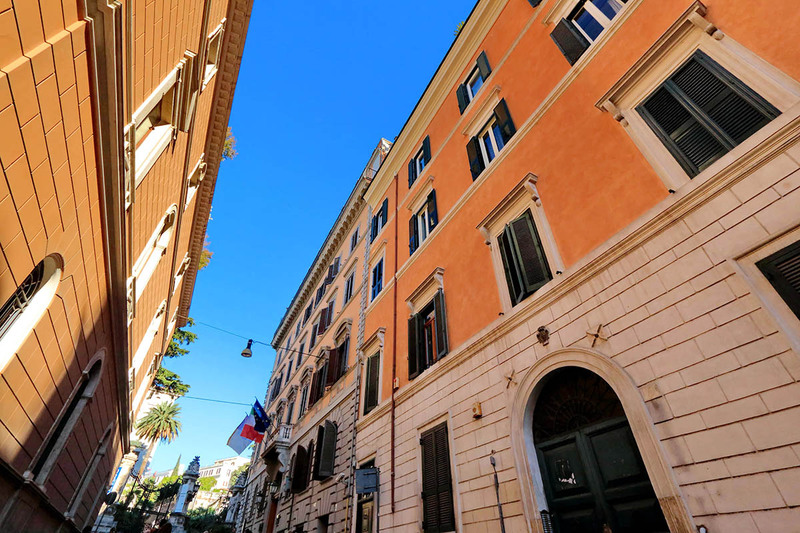 This also means you then have indirect but easy access to the Trevi Fountain, Piazza Venezia, Pantheon, and from there also the Campo de Fiori and Navona areas. The latter two are especially atmospheric in the evenings, due to the large density of great restaurants and bars where you can enjoy an aperitivo or some exquisite Roman cuisine. We would also recommend the restaurants around the Spanish Steps area, which cater to a more refined and elegant crowd. 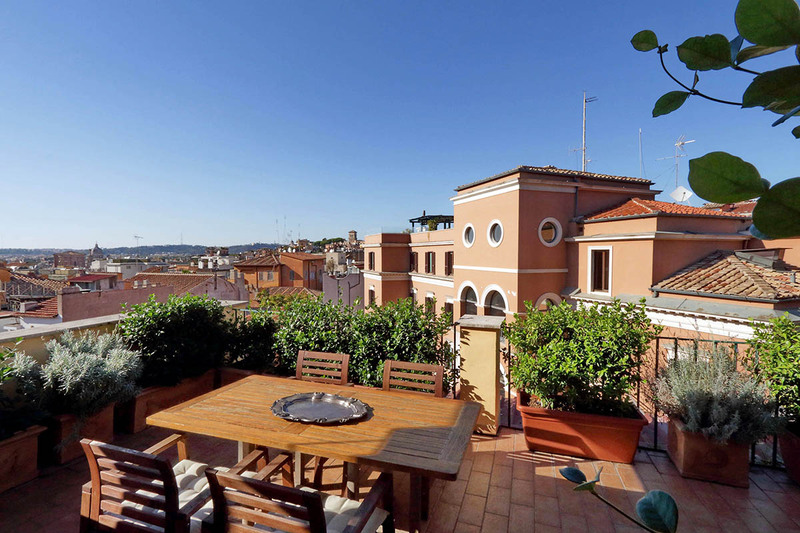 The location of this apartment is just perfect, close to metro, museums and loads of restaurants. 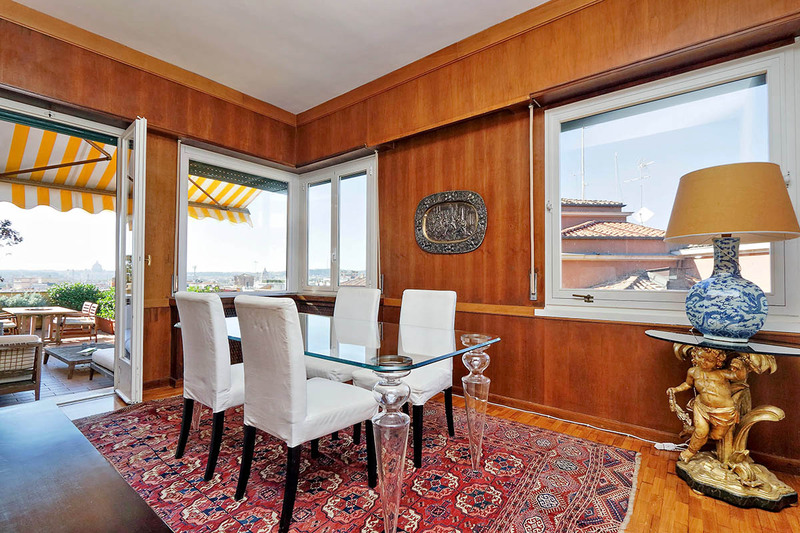 The apartment is spacious with a large living room and a diningroom and it has an amazing view from the terrace. The kitchen was fine for making breakfast but would benefit from a microwave and dishwasher. The bedrooms were a good size with comforta...Read Moreble beds, the bathrooms were also fine although they could do with updated fittings such as the showerhead. There were plenty of shops, bars and restaurants around to choose from. The staff was very helpful. We enjoyed our stay. 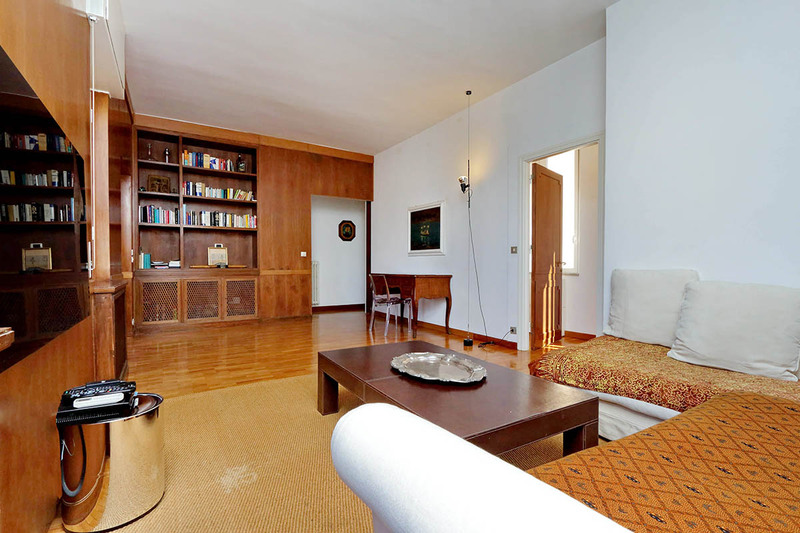 This lovely apartment was ideal for our time in Rome. We could walk to all the main sites from the apartment. The terrace was so lovely, we made a point of being "home" by sunset each night to enjoy the gorgeous view over the city. And the scent of the Jasmine bushes was such a good memory! Lorenzo is so responsive and helpful. I highly r...Read Moreecommend this spot. All communication with RomeLoft has been very good and they were so very helpful to us when my friend got ill. They arranged our airport transfer which was prompt and trouble free with a fantastic driver who was full of advise and tips. We were met at the apartment and given all the info we needed. The apartments have a small lift which is rare and...Read More being on the 5th floor, was much appreciated! I can not stress how great the apartments fantastic location is. It is within easy walk of ALL Roman sites. The apartment rooms are all spacious, its big! 1 of the bedrooms has no air-con but there is a fan and we were just fine. Bathrooms were great too, showers a little compact for a larger person to use. The terrace was very big, plenty of seating and of course SO great with stunning views. Being mid-September though the sun didn't make it on it till about 5pm, but with so much to see and do in Rome you aren't there to sunbath! 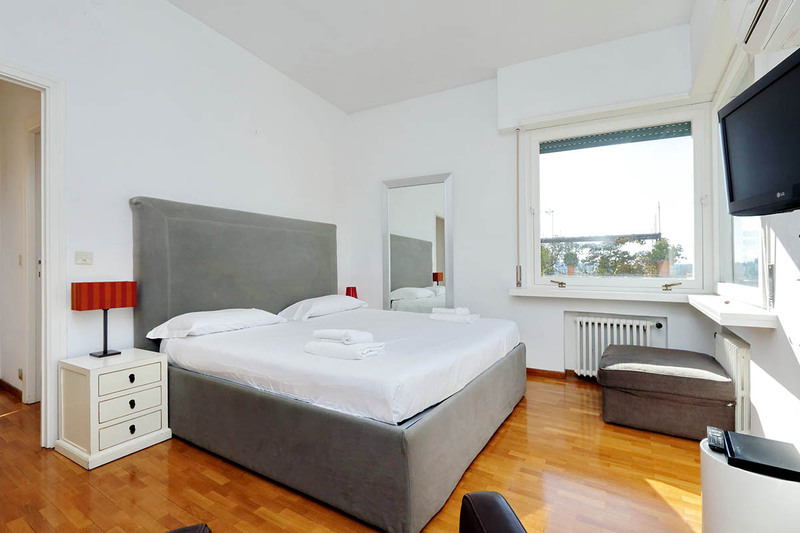 We would definitely recommend staying here and using RomeLoft. 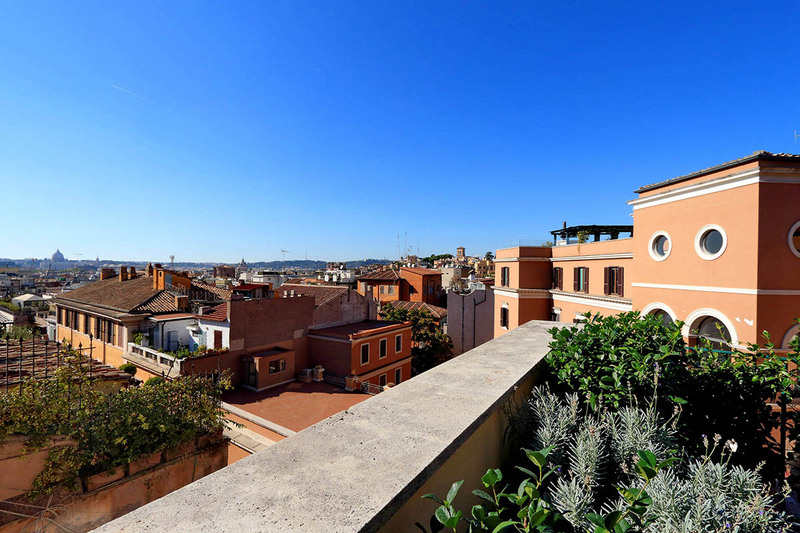 The staff of Rome Loft (especially Martin) were very helpful - the pick up and return to and from the airport was smooth, prompt and reliable The apartment itself was beautiful - we really fell in love with the roof terrace and had breakfast out there every day. All the rooms were clean and comfortable - we would perhaps have liked a little more k...Read Moreitchen equipment/bathroom supplies. Some of the plugs need a bit of attention The location of the apartment couldn't have been better. It was very easy to get to everything - Trevi Fountain, Spanish steps, near a metro, near dozens of restaurants. I would have perhaps liked a Visitors book where guests could put down favourite restaurants they've discovered or just little tips or an A4 folder with leaflets. We had our guide book but it's always nice to hear what other people have enjoyed near by. We really enjoyed our stay and would definitely recommend to friends (it was recommended to us by friends). We threw coins in the Trevi fountain which means we will return! Very impressed with the service of RomeLoft. The booking process was easy and clear, the team were very responsive to my queries. Everything, including all the transfers we had requested, ran like clockwork and made our holiday very easy and relaxed. The apartment we stayed in was absolutely perfect. The location meant we could easily walk to eve...Read Morerything we wanted to see and having the beautiful terrace to relax on at the end of the day made all the difference. The only thing that unnerved me was the electrics (plug sockets hanging out of the wall!) and it would have been nice to have some dessert bowls. 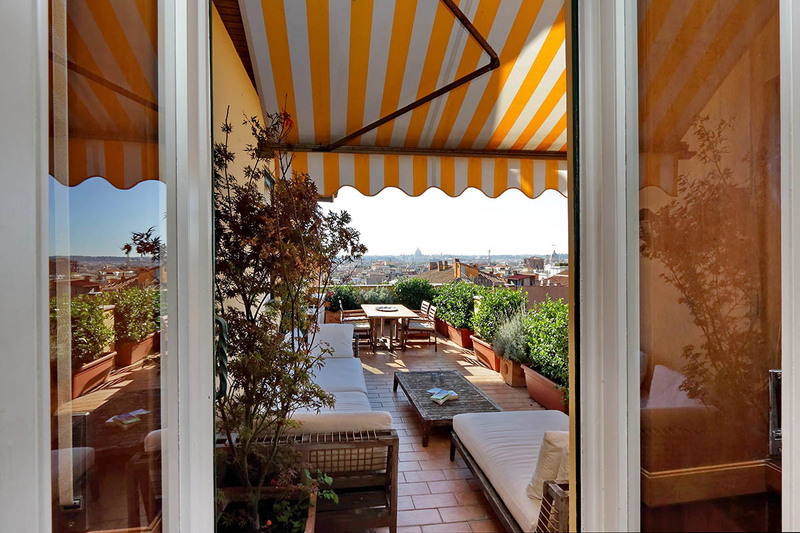 We loved our stay at the Barberini terrace apartment. 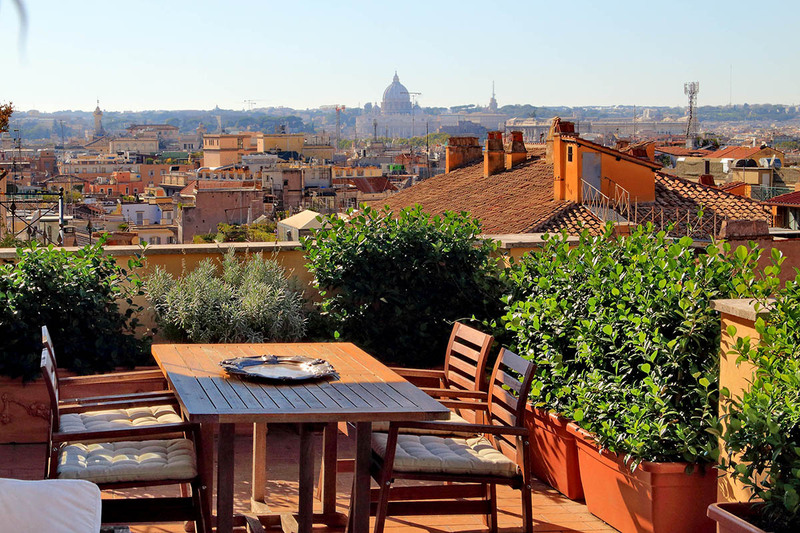 It was just a short walk from the Barberini metro station but the highlight for us was the terrace which looks out to St Peter's basilica. It was a marvellous entertainment space and great for chilling out after a hard day of sightseeing. 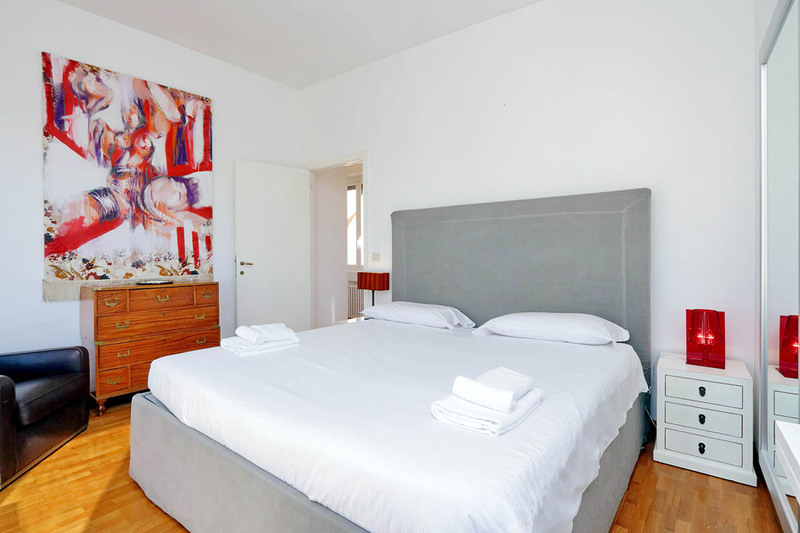 The apartment is particularly well furnished and we ...Read Morefound the staff to be awesome. Not only did they arrange transport back to the airport when we left but they allowed us to leave our bags in the apartment until when the car arrived to take us back to the airport. 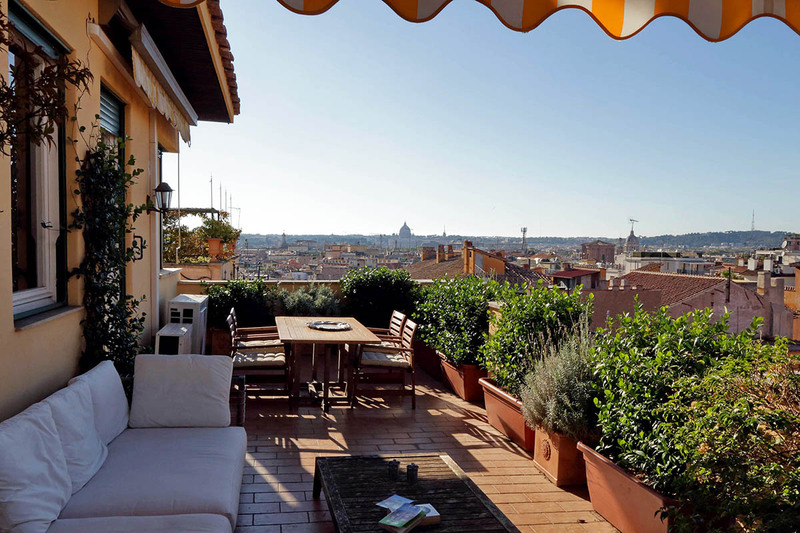 For this reason, I would gladly return to this apartment and recommend this to any other travellers to Rome. 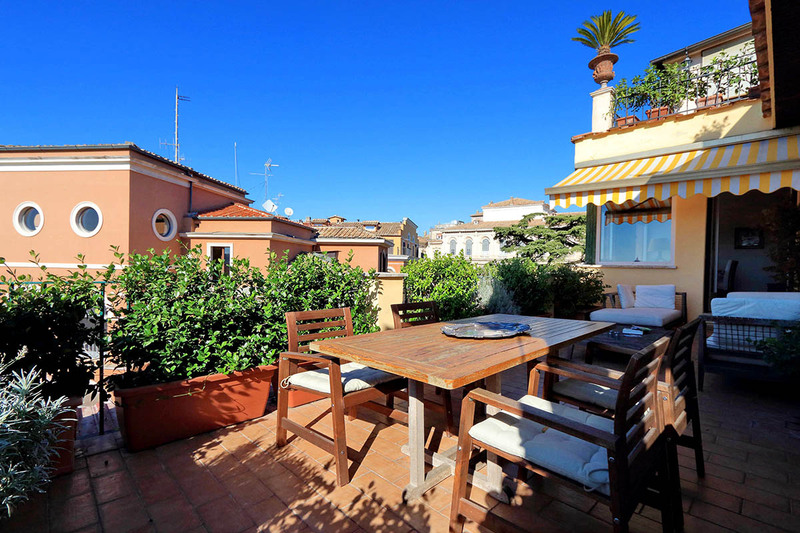 Very Large balcony with wonderful views to the West, including St. Peter's. The bedrooms were good, with one being far superior. Showers stalls quite small. The kitchen was extremely small and lacked some basic stuff (like glass tumblers). The lift was a two person unit only but the stairs provided good exercise. 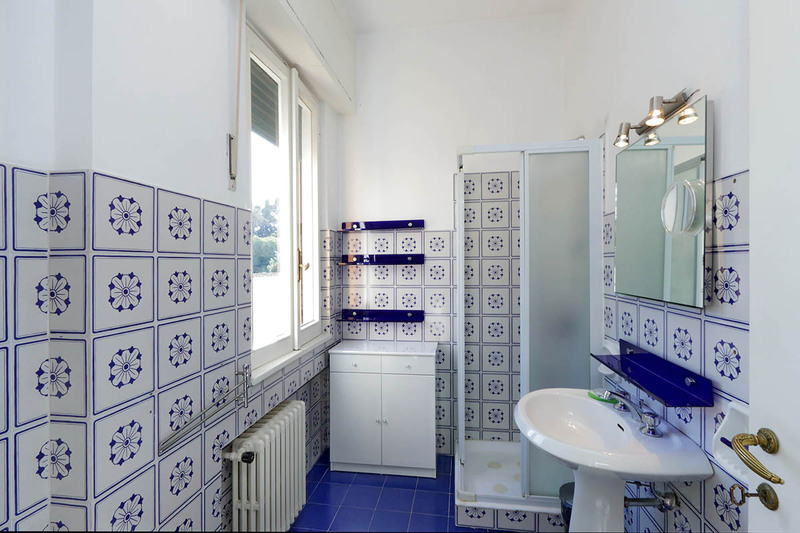 Very good location with the me...Read Moretro stop only 5 mins walk away. Rome Loft delivered excellent service for the second time I have used them. Top-rated. 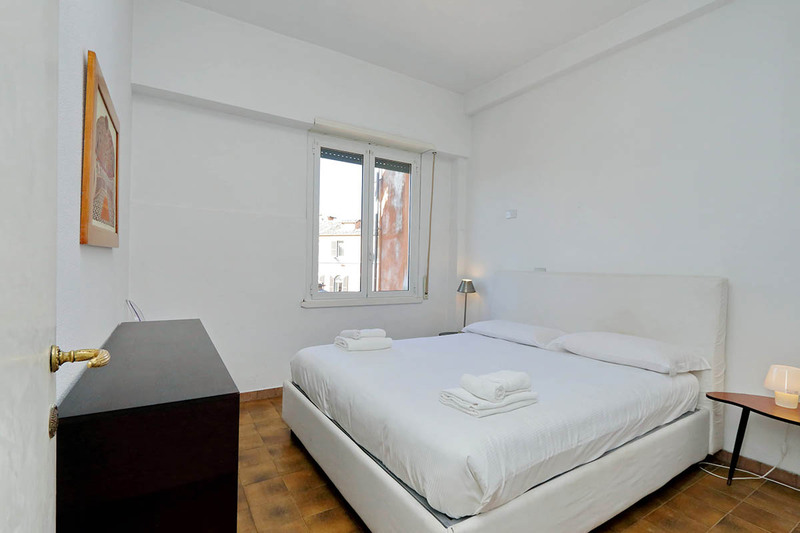 The apartment itself is very spacious, comfortable and tastefully furnished. The view from the terrace is spectacular. Mid-winter, it was warm as well as being exceptionally light and cheerful. The kitchen lacked a dishwasher, which I'd expect in a high...Read More quality rental of this kind. Otherwise, it filled the bill perfectly. The lift gets you right up to the apartment, with only a few steps at street level from the front door of the building . The whole set-up is a civilised haven, up among the roof-tops and remarkably quiet. Good places to eat in the immediate locality (thoughtfully identified by Rome Loft) and an OK supermarket a few minutes walk down the hill. Its a very central location and you can walk to virtually everywhere - suggest studying a good map to work out routes that avoid the tourist hordes (e.g. around the Trevi Fountain). 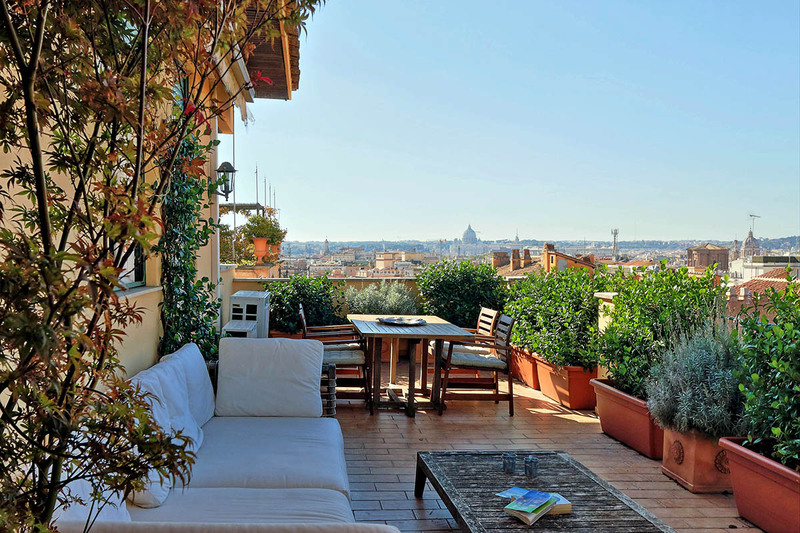 I would certainly stay in this apartment again on my next visit to Rome. Our first stay using RomeLoft...so wasn't sure what to expect, but completely happy that we did. First their customer service is exceptional. They answered all my emails and calls. 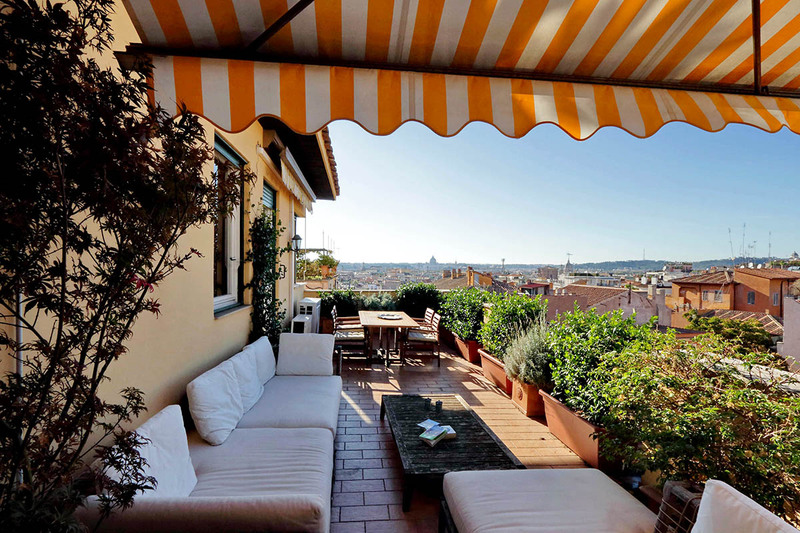 Nissar met us at the unit and showed us around...thank you...ok...now about the unit: The Barberini home is a top floor unit with an amazing view of the St. Pet...Read Moreer's Basilica. 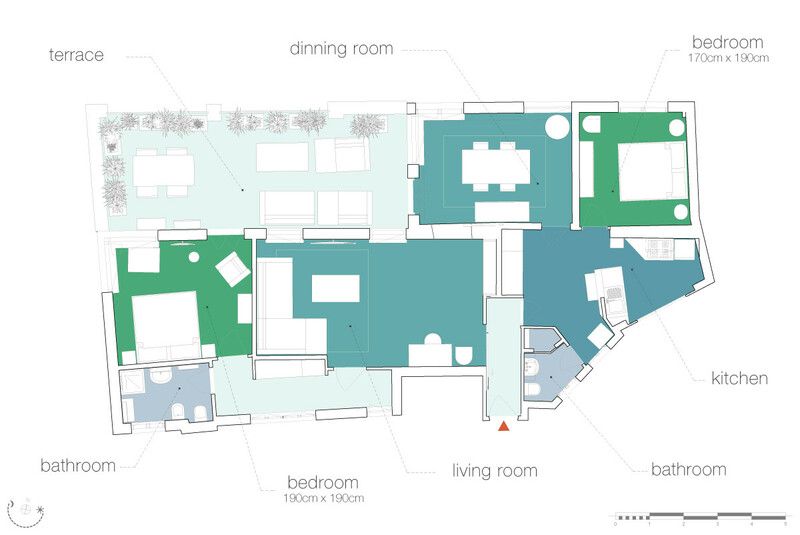 The home has 2 bedrooms/2 baths on separate sides of the unit, so you plenty of space. While we didn't really use the balcony due to the time of the year, I can certainly say that it's probably the best benefit of this home in you plan on spending time during the summer months. Pros: Location, size of the unit, elevator. Cons: Smaller shower's, minimal towel's in the home. Would I stay and recommend this place...absolutely! We spent 4 days in Rome mid of September and I didn't expect Rome so crowded with tourists from all over the world. 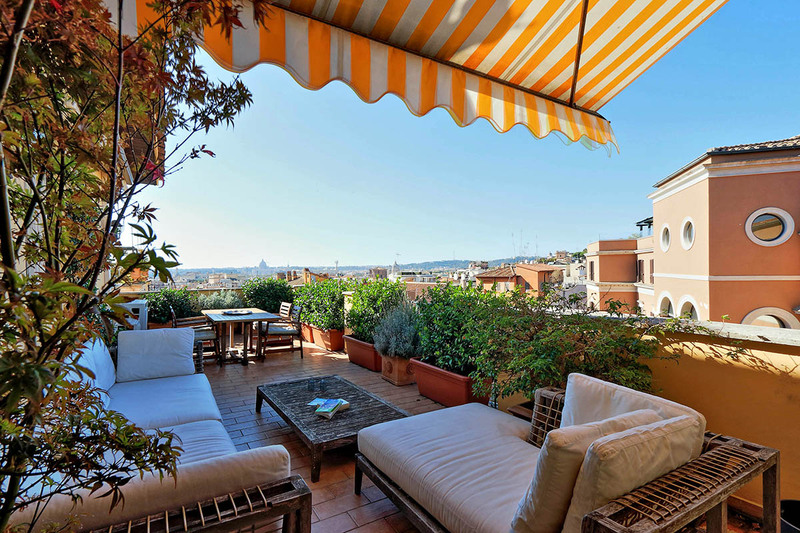 So this apartment was a perfect hideaway with its luxurious terrace from the busy Rome . We enjoyed the dinner on the roof terrace with ham and cheese and white wine from the shops nearby. The airport pick-up, organized by Romelo...Read Morefts was very good and the driver called our contact person with the apartment keys. We are very satisfied with all the services of Romelofts. We chose this apartment for its location and we wanted a terrace because of the warm weather. Located on the top floor, it was great that there was a lift in the building. 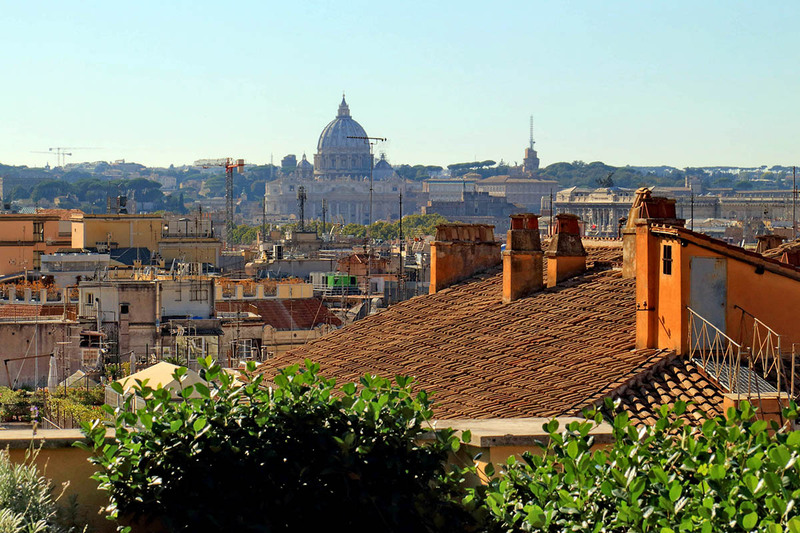 The apartment was spacious overall and the terrace was large and had a lovely view which included St Peter's in the distance - pretty at night! The kitchen was a little lac...Read Moreking in equipment if you wanted to cook, we would have liked an electric kettle and some tea cups, not everyone drinks coffee! The bed was very large and comfortable, bathrooms good but the showers were tiny and we're not big people. Location was good - easy walk to Trevi fountain, pantheon and Spanish steps and we walked to Vatican City also. Great shopping area around the apartment and 2 very good supermarkets for non food items. Overall, very comfy and enjoyable stay.